Venture just nine miles north of Bonsal on the Old US1 highway, and you will find yourself in the heart of historic downtown Apex. As your odometer clicks over that ninth mile, look to your right and you will see Fire Station #1 and the Apex Union Depot. The fire station is interesting enough since two railroad tank cars are buried beneath it (a story we will tell at another time) but the station building turned a full one hundred years old this year. 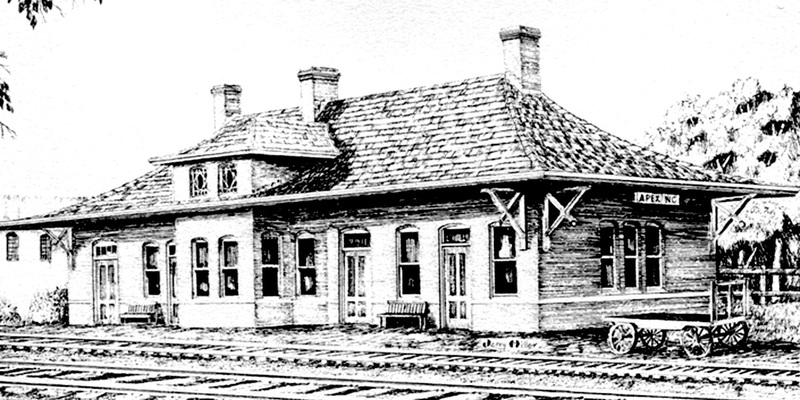 Apex Union Depot black and white drawing. 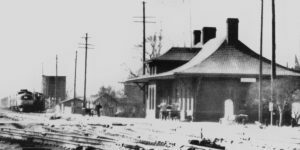 The Apex Union Depot is the most prominent site in Apex and has a long and varied history. 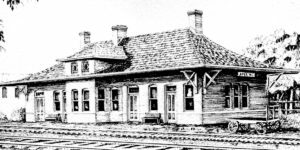 The first depot built in what would become Apex was little more than a wooden shed with a desk and chair inside for the part-time Agent and a small bench for passengers inside. It is believed to have occupied the site now holding the CSX Freight House on the north side of Center Street and was constructed in late 1870 when the then named Chatham Railroad was completed through the town. That railroad was renamed the following year as the Raleigh & Augusta Air Line Railroad and became part of the Seaboard Air Line Railroad System in 1901. About 1904, the Durham & Southern Railroad was upgraded from a lumber tram from Angier to Apex, chartered as a common carrier, and onwards through Apex eventually reaching Durham. At that time a new proper wooden station building replaced the old shed. This structure is believed to have occupied the site now used to display a bay-window caboose next to the existing depot. Apex Union Depot black and white photo with a train arriving in 1950. By 1911 over thirty regular trains, passenger and freight, passed through Apex daily and the depot became a point of contention between the Town of Apex and the railroads. The town maintained the wooden station lacked proper heating and toilet facilities while the railroads complained about the lack of electricity and sewer systems in the town. In June of 1911 a massive fire destroyed most of the downtown business area, and although the railroad water tank next to it succumbed to the flames, the wooden depot remained untouched. The primary result of the fire was a town ordinance requiring “all buildings within the downtown fire district be constructed of brick.” Note today all the stores in the first and second blocks of Salem Street are constructed of brick. After the fire, the town and the railroads opened talks about replacing the depot with a newer structure. Then in 1913 the wooden depot itself burned, starting a serious movement for a new depot. The railroad wanted to build another wooden depot, but the ordinance forced the building of a brick depot. A brick railroad depot for a town the size of Apex at the time was not standard for the railroad and considered a luxury. Brick depots were reserved for cities like Raleigh, not for Apex. Grudgingly, the railroad chose plans for the smallest standard brick station building on file and construction was done in 1914. The new depot, the current structure you see today, opened for business in early 1915 and cost the railroad a total of $8,586 to build. Note the freight depot just across Center Street from the present depot was technically outside the downtown fire district and so was built of wood. Apex Union Depot black and white photo in 2014. The remarkably well-preserved Apex Union Depot is built on a simple rectangular plan, measuring 76’ 8” by 30’ 6”, with 13’ 6” wide bays projecting 5’ at the centers of the trackside and Salem Street elevations. A bellcast hip roof covers the building and is still laid with the “Cartwright’s Victoria Galvanized Shingles or equal” specified in the original plans. A 7’ roof overhang shelters the walls, supported at the corners with heavy chamfered brackets. On the Salem Street side, the bay terminates under the slope of the roof, while the trackside bay breaks through the roof to form a hipped dormer. The dark red brick veneer, laid with red tinted mortar, is the “Oriental Brick” specified in the original plans. Windowsills, doorsills and a continuous stringcourse around the building, doubling as the sills of the larger windows, are brown sandstone. Several windows are original poured glass. The baggage room doors on the south end of the building provided access for baggage carts, and the double-leafed sliding doors at the rear of the room opened to the loading dock. Original, conical cast iron corner guards, manufactured by Raleigh Iron Works, protect all four exterior corners of the building and the jambs of the baggage room doors. The interior plan has retained much of the 1914 design, including racially segregated waiting rooms and toilets, an arrangement common to all depots built during that era. The waiting room for Whites (north end) and Blacks (south end) was divided across the center of the building by the stationmaster’s office. The bays contain this office in the trackside bay and the utility closets and toilets on the Salem Street Side. The north side waiting room was partitioned on its north end to create a Men’s Room and a separate lounge and toilet for White women, but this has now been converted into an office and storage room. On the south end, the Black waiting room (now a conference room) remains much as it did in 1914, but the baggage room adjacent has been partitioned for a mechanical room. The stationmaster’s office remains no passage between the waiting rooms was available except by going through the stationmaster’s office or walking around the outside of the building. Now a narrow hall connects the two former waiting rooms and the previous Black Women’s Room was converted into a kitchen area. The interior finish is well preserved. The walls are plaster over wainscoting with a symmetrically molded 61/4” chair rail, a dado paneled with vertical bead board, and a wide baseboard. 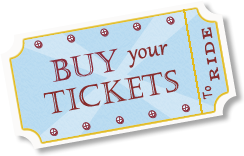 Windows and door frames, including those for the ticket windows, are molded and mitered. Three fireplaces, one double-sided, originally heated the two waiting rooms and the Woman’s Lounge. The fireplaces’ elaborate paneled mantles of neo-classical design have Ionic capitals on the pilasters flanking the fireplace openings and carry a deep shelf. One original wooden stall with louvered doors remains in the toilet area and the original oversized urinal in the Men’s Room still functions. A heavy iron light fixture with six railroad lanterns hangs in the office lobby. The lanterns, now converted from oil to electricity, are stamped with the names of five different railroads. Several switchmen’s lanterns hang outside the building and a small metal plaque at the rear of the building identifies the highest point on the railroad. 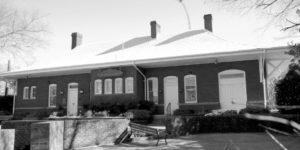 When passenger service to Apex was discontinued in 1969, the depot was acquired by the Town of Apex for use as a public library, although CSX Transportation Corporation retained ownership of the land. In 1988 the building was listed on the National Register of Historic Places. When the Eva Perry Regional Library was opened in 1996, the building was leased to the Apex Chamber of Commerce as its offices and visitor center. With assistance from the community, especially Chamber members, the depot was refurbished, carefully preserving and restoring it as much as possible. Today the historic Apex Union Depot welcomes thousands of visitors each year, serves as a meeting and information center, and plays host to a variety of events including band concerts and festivals. The Apex Farmers Market occupies the parking lot on Saturdays during the summer. Special thanks for the information in this article to Apex Ambassador J. C. Knowles, the Apex Historical Society, and the US Department of the Interior. Contributing resources include Pluck, Perseverance, and Paint the Carl Holleman edition (1973) and the Warren Lee Holleman and C. P. “Toby” Holleman, Jr. edition (2010), 2002 Guide to Apex, the Apex Chamber of Commerce, and the Apex Downtown Business Association (ADBA).